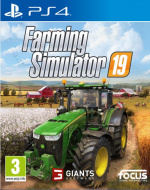 You can ride horses in Farming Simulator 19, which is one hell of an addition to a franchise that grows with each instalment. This new Gamescom 2018 trailer shows off the upcoming sequel in all of its earth churning glory, introducing some of the 300 vehicles you’ll be able to commandeer come 20th November. Giants Software is promising the largest garage in the series’ short history – and a complete visual overhaul as well. Hm, maybe they'll have some form of herding component in the future, that would be really cool methinks. Oh thank goodness, I was fretting about that.